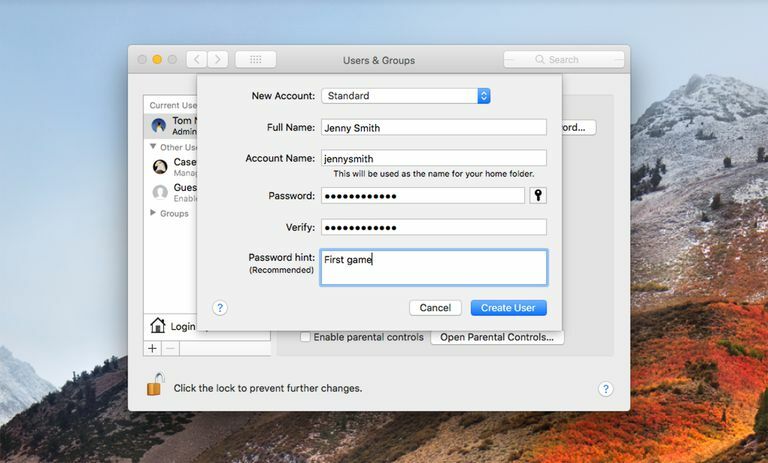 Standard Mac user accounts are a great way to add additional users. The Mac's operating system supports multiple user accounts which allows you to share your Mac with other family members or friends while keeping each user’s information safely protected from other users. Each user can select their own favorite desktop backgrounds, and will have their own Home folder for storing their data; they can also set their own preferences for how the Mac OS looks and feels. Most applications allow individuals to create their own set of application preferences, another reason to create user accounts. Each user can also have their own iTunes library, Safari bookmarks, iChat or Messages accounts with their own list of buddies, Address Book, and iPhoto or Photos library. Setting up user accounts is a straightforward process. You will need to be logged in as the administrator in order to create the user accounts. The administrator account is the account you created when you first set up your Mac. Go ahead and log in with the administrator account, and we’ll get started. Mac OS offers five different types of user accounts. In this tip, we will be creating a new standard user account. Click the Accounts or Users & Groups icon to open the preferences pane for managing user accounts. Click the lock icon in the bottom left corner. You will be asked to provide the password for the administrator account you are currently using. Enter your password, and click the OK button. Select Standard from the dropdown menu of account types; this is also the default option. Enter the name for this account in the Name or Full Name field. This is usually the individual’s full name, such as Tom Nelson. Enter a nickname or shorter version of the name in the Short Name or Account Name field. In my case, I would enter tom. Short names shouldn’t include spaces or special characters, and by convention, use only lower case letters. Your Mac will suggest a short name; you can accept the suggestion or enter the short name of your choice. Enter a password for this account in the Password field. You can create your own password, or click the key icon next to the Password field and the Password Assistant will help you generate a password. Click the Create Account or Create User button. The new standard user account will be created. A new Home folder will be created, using the account’s short name and a randomly chosen icon to represent the user. You can change the user icon at any time by clicking the icon and selecting a new one from the dropdown list of images. Repeat the above process to create additional standard user accounts. When you’ve finished creating accounts, click the lock icon in the bottom left corner of the Accounts preferences pane, to prevent anyone else from making changes. Mac OS user accounts are a great way to allow everyone in the household to share a single Mac. They’re also a great way to keep the peace, by letting everyone customize the Mac to suit their fancy, without affecting anyone else’s preferences.